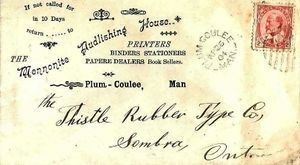 Envelope printed by the Mennonite Publishing House, Plum Coulee, MB. The business name "Mennonite Publishing House" was used by Abraham Wolfe for a short time in his efforts to publish and distribute Mennonite literature in Manitoba in the earliest years of the twentieth century. The multi talented Abraham A. Wolfe (1876-1945) worked as a school teacher but also had a talent for mechanical devises. About 1901 began a small scale printing business in southern Manitoba presumably to provide much needed materials for schools and he also began to provide pamphlets to meet the demand from conservative Mennonites for devotional literature. He is thought to be the first Mennonite printer in Manitoba. The works known to have been printed by Wolfe are listed below. About 1903 or 1904 he began printing under the name "Mennonite Publishing House" with its business location as the village of Plum Coulee, Manitoba. After a year of two he ceased his printing and the use of the name of his printery lapsed. Printing is rarely profitable and at this time Wolfe may have begun his medical education which he took in Minneapolis, New York and Chicago. In 1922 Wolfe left with other Mennonites for Mexico then returned to Manitoba in 1935 where he again took up printing. There appears to be no connection between the name of Wolfe’s printery, "Mennonite Publishing House," and the Scottdale, Pennsylvania, "Mennonite Publishing House" which began publishing in 1908. Dyck, Jakob. Erster Brief vom Ehrw. Ältester Jackob Dyck vom Jahre 1846. von Jakob Thiessen abgeschrieben Gnadenthal, P. O. Plum Coulee, Manitoba. [Published by] A. A. Wolf, . 6, 45 pp. Balzer, Heinrich. Der Balzer = Brief! Oder eine Geschichte und Gedicht wie und warum Lehr. Heinrich Balzer ist ausgegangen. Gnadenthal, P. O. Plum Coulie, Manitoba. [Published by] Abraham A. Wolf. "In Druckgegeben im Jahr 1903." (2), 13 pp. Wiens, Heinrich. Ein Abschied und Bericht wie es in der Molotschnerkolonie in den früheren Jahre zugegangen ist, und wie die Vorgesetzten der her. Aeltesten Heinrich Wiens von Gnadenheim aus dem Lande verwiesen haben: Seine Rückkehr nebst Beschreibung der Ganzen Reise. Gnadenthal, Manitoba. P. O. Plum Coulee, Manitoba und Neuhorst, P. O. Gretna, Manitoba. [Published by] Abraham A. Wolf, 1903, 64 p.
Glaubensbekenntnis der Mennoniten in Manitoba, Nordamerika. Plum Coulee, MB: Mennonite Publishing House, 1904, 38 pp. Katechismus, oder, Kurze und einfache Unterweisung aus der Heiligen Schrift. In Fragen und Antworten. Zum Gebrauch in den Schulen. Glaubensbekenntnis der Mennoniten in Manitoba, Nordamerika. Plum Coulee, MB: Mennonite Publishing House, 1904. xii, 68, (2), 38 pp. Plett, Delbert F. "Abraham A. Wolfe 1876-1945." Preservings no. 17, (December 2000): 48-52. Wiebe, Victor G. "Mennonite Publishing House (Plum Coulee, Manitoba, Canada)." Global Anabaptist Mennonite Encyclopedia Online. June 2014. Web. 20 Apr 2019. http://gameo.org/index.php?title=Mennonite_Publishing_House_(Plum_Coulee,_Manitoba,_Canada)&oldid=133231. Wiebe, Victor G. (June 2014). Mennonite Publishing House (Plum Coulee, Manitoba, Canada). Global Anabaptist Mennonite Encyclopedia Online. Retrieved 20 April 2019, from http://gameo.org/index.php?title=Mennonite_Publishing_House_(Plum_Coulee,_Manitoba,_Canada)&oldid=133231. This page was last modified on 28 December 2015, at 07:08.